So here are a few fun pieces that I recently did. I'm mostly asked to draw mice, but from time to time I'm asked to do my take on something from the traditional world of comics fandom or pop culture. I love drawing mice, but it's a nice break to not draw them and get to be a bit more creative in thinkining about "how would I draw that character?" 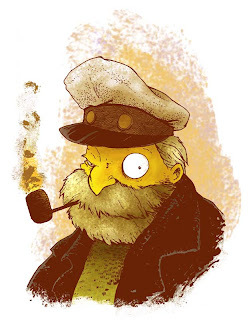 The Sea Captain from the Simpsons.I looked through the guy's sketchbook to see if he liked having artists do their own version or just wanted them to mimic Matt Groening. I was happy to see that he enjoyed the more unique takes on the characters...While I didn't stray too far with this guy, I feel like there is a nice dose of David Petersen in this piece. 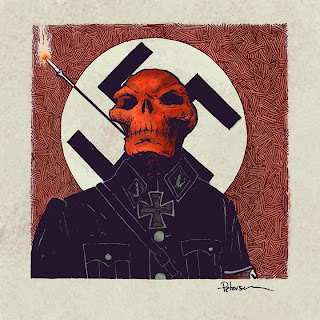 Marvel Villian: The Red Skull!! !This guy had a book of all villians. I was thinking about who to do, Magneto, Juggernaut, Vader, Joker, when I saw that someone before me had done a cool Skelletor sketch..I thoght.."awww, I want to draw a skull now...OH RED SKULL!!!" I took the book back to my hotel room and looked up some refrence on the uniforms of the Nazis and blended some of the more menacing pieces together. I really love your artwork, and I especially like your takes on all of these characters. 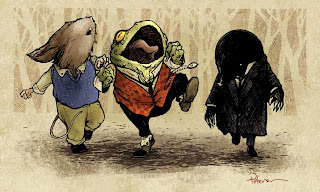 I'm also a fan of your Mouse Guard works. Do you do your colorings with Photoshop? Well, anywho, haves a great summer! 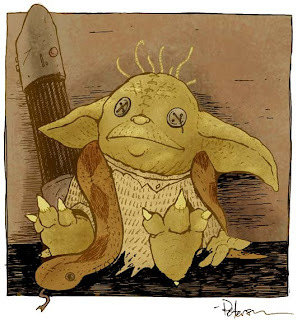 I love all of these, particularly the Yoda. It's great to see other characters in different artist styles. kai, yes, I do the coloring in photoshop. I love Red Skull and your vision of him is the most beautifull I have ever seen. I love it. This illustration takes a huge part of my heart.